Akihito Okuda made his critically-acclaimed debut with the Kanagawa Philharmonic Orchestra at the age of 12 after winning the Kanagawa Piano Competition in Japan. Since then, he has won numerous prizes in both national and international competitions such as the International Piano Competition for Young Pianists Ettlingen in Germany, the Chopin Competition in Asia and the Takahiro Sonoda Award Piano Competition in Japan. In recent years, he went on to become the finalist in the Busoni International Piano Competition and was also the first prize winner in a number of international competitions, including the Pietro Argento International Competition in Italy and the Young Concert Artists European Audition in Leipzig, Germany. His exceptional performance of a Chopin Etude at the Shura Cherkassky International Piano Competition led to the Jury`s spontaneous decision to set up and award him a Special Prize for Best Performance of a Chopin Etude. After winning the 2010 Isang Yun Special Prize in the Isang Yun International Competition in Korea, he took home third prize as well as the award for the best performance of modern music in the prestigious 23rd Epinal International Piano Competition in France in 2011. In the following year, he was honoured with the Marguerite Meister Crescendo Music Prize in Switzerland for his activities in music and was the winner of the Val d’Isère Master Project in France. In 2016 , he was awarded a medal in the Maria Canals International Competition. Akihito has given recitals in various countries of Europe, Africa and Asia, including at prominent venues such as the Yokohama Minato Mirai Hall and Tokyo Geijutsu Gekijo. As a soloist, he has collaborated with orchestras such as the Osaka Symphoniker, the Kyushu Symphony Orchestra, the Bratislava Symphony Orchestra and the Karlsbad Symphony Orchestra. In 2013, he made his debut in the Berlin Philharmonie as well as in the Hamburg Laeiszhalle, performing Chopin’s first concerto. A native of Japan, Akihito began his musical studies at the age of five and spent his childhood in Bahrain, Switzerland and Hungary. His teachers include Naoyuki Taneda and Wolfgang Manz before moving to Germany to pursue his piano studies with Klaus Hellwig in Berlin and Homero Francesch in Zurich. Through the years, he has received further musical impulses from prominent musicians such as Fou Ts’ong, Karl-Heinz Kämmerling, Bernard Ringeissen, Cyprian Katsaris, Kevin Kenner and Paul Badura-Skoda. His profound belief in a broad-minded approach to music has also led him to study policy management at Keio University in Japan, musicology at Humboldt-Universität zu Berlin, child rights at Freie Universität Berlin and at the University of Oxford. Akihito had long been a promoted artist of Yehudi Menuhin Live Music Now and has appeared on a multitude of radio and TV stations in various countries including the NHK and the BBC. 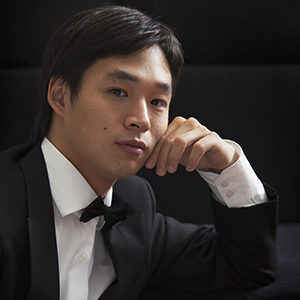 Akihito Okuda is the prize winner of more than 30 national and international competitions and achieved international recognition in some of the most renowned competitions such as Ferruccio Busoni (Italy), Ettlingen (Germany), Isang Yun (South Korea), Maria Canals (Spain) and Epinal International Piano Competition (France).